The Duluth Forge Dual Fuel Ventless Gas Stove features our Patented Dual Fuel Technology which allows you the option to operate with Natural Gas or Liquid Propane. Heat up to 1,100 sq. ft. of your home with 23,000 BTU of power. 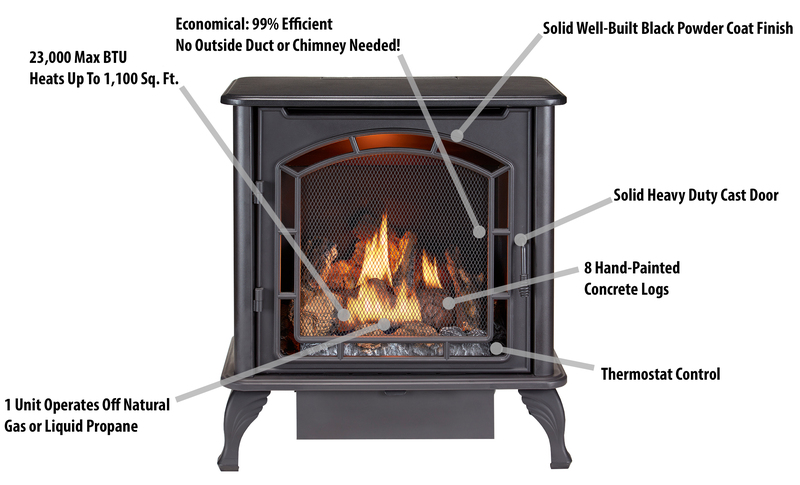 This hearty Gas Stove is easy to install and extremely efficient. You won’t miss out on ambiance either, since the U-Burner chassis design and detailed, hand painted logs create such a realistic fire. Our Dual Fuel Ventless Gas Stove is the solution for your home’s alternative heating needs, without skimping on warmth and decorative appeal. 23,000 BTU Heats up to 1,100 sq. ft.
Stove Dimensions (HxWxD): 27.32" × 25.98" × 16"
Carton Dimensions (HxWxD): 29.68" × 28.35" × 18.31"